The owner is to supply everything for your cat, this includes: food, dishes, litter, litter tray, bedding, toys (anything that will help your cat to feel as comfortable as possible). I have single or family units for cats sharing from the same household. I offer a discount for 3 or more cats. 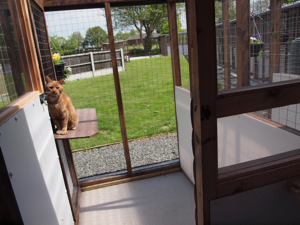 Each unit has a spacious, light indoor area for eating and sleeping with access to an outdoor covered run so your cat can snooze the day away on one of the shelves or watch the wildlife in the surrounding open countryside. 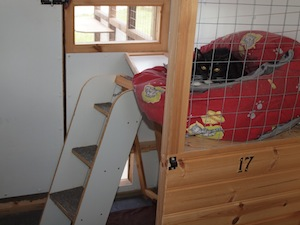 Special consideration and facilities are provided for the more mature cats. I will administer prescribed medication free of charge including injections for diabetic cats. 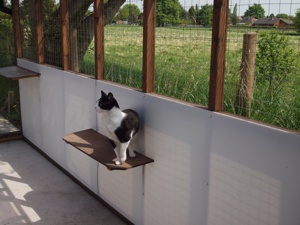 Your cat(s) current up to date vaccination certificate must be produced on arrival. Payment by cash or cheque, no facilities for card payment.